NOT my actual iron. If I had a cloth-covered cord, I could plug in this 6-pound, dry-heat GE Wolverine Hi-Speed Calrod iron, mist all my linens with a shaker bottle, roll them up, wait half a day till they’re evenly damp . . . oh, forget it. Well, Janeray, I can’t compete with the sheer amazing number of vintage tablecloths you’ve got. I started collecting them years later than you did, after all. And I can’t compete with your brand-spankin’-new super-steamo iron, either. Oh yeah. I got you beat on that one! 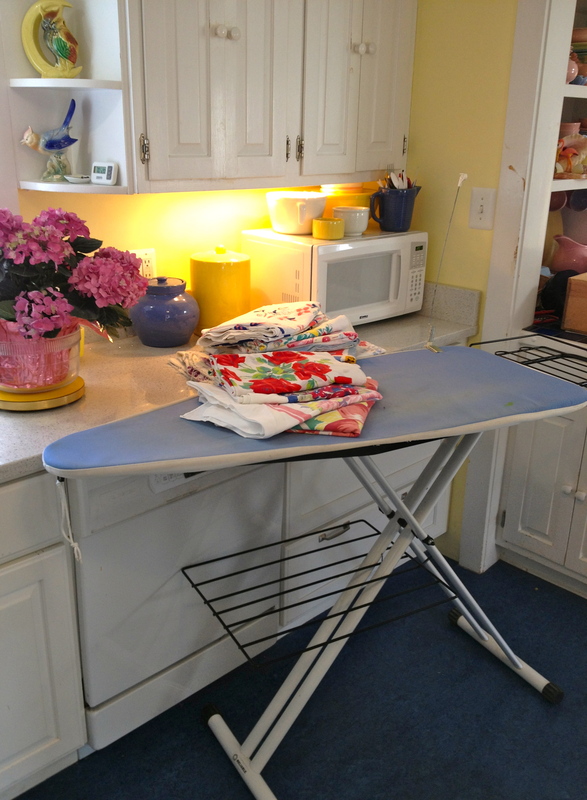 When I got married, I had a rickety 1980s ironing board and Bluesray had a super sturdy 1960s ironing board. We kept his and took mine to the thrift shop. 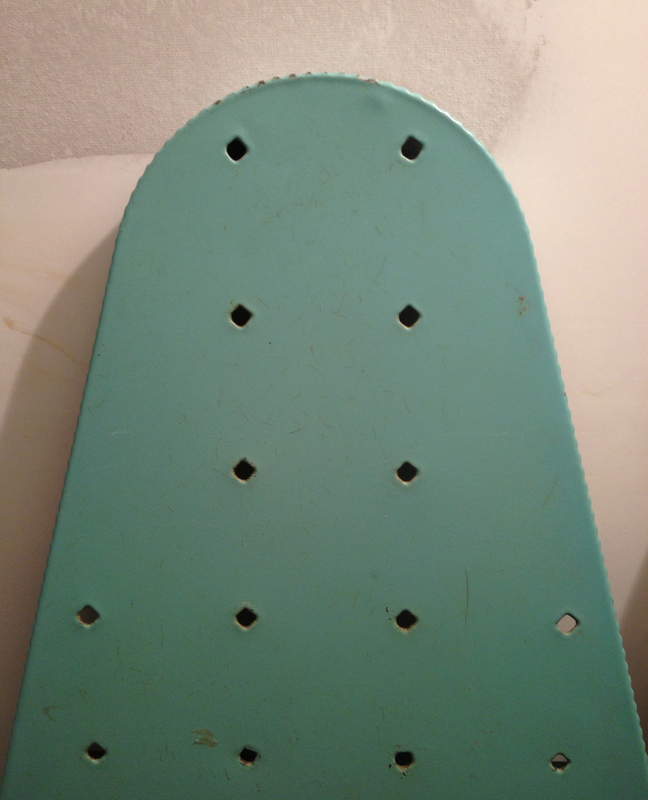 My poor 1960s aqua ironing board, relegated to the basement where the walls aren’t even painted! Twenty-some years later, a couple of the welds on that ancient aqua board finally failed. I couldn’t bear to trash it, though, so it’s down in the basement now, patiently waiting to be repurposed as a display piece for shows. And then I went out and found the ironing board of my vintage tablecloth dreams: the Reliable Longboard. By day, it’s an ordinary-looking Clark Kent of a board with that pointy bit on the left (if you’re right-handed, that is. If you’re left-handed, just look at the pictures in a mirror). There’s a wire rack on the right side for unironed things, and a handy shelf underneath for piling up finished things. But, as everyone who’s ever ironed a tablecloth or fabric yardage knows, that pointy bit of the board causes problems. You can’t properly iron a swathe of fabric any wider than the width of the pointy bit, without leaving sorta-crease marks where the cloth hangs (and stretches!) over the sides of the point. 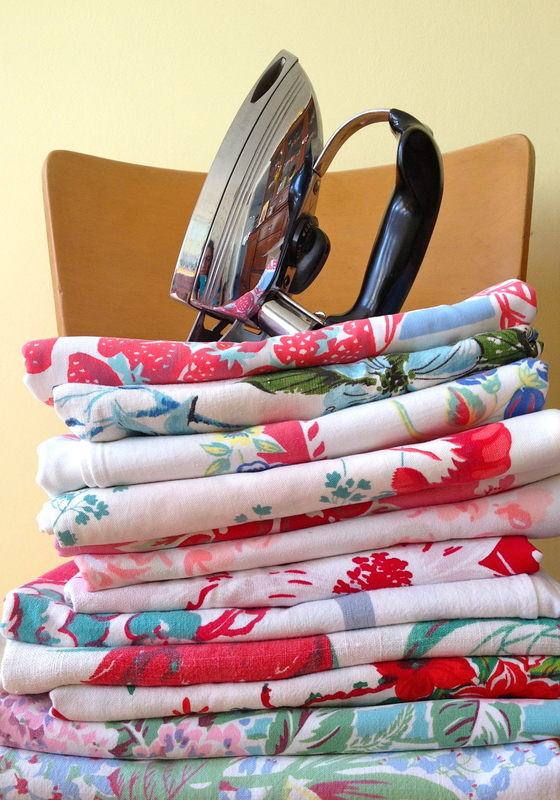 So you end up ironing four measly inches at a time. This board, however, steps into a phone booth and transforms itself. Take off the padded cover, slide on the steel mesh extension piece, pop on the bigger cover . . . .
. . . and you have a Superman of a rectangular ironing table that measures a whopping 55 inches long by almost 19 inches wide. It’s so big I couldn’t get a good picture of it in my kitchen. Downsides? Yeah, there are some. It’s very heavy. I store my Reliable folded up on the wall in our small laundry room, and it does take some muscle to fold and carry it. If you had space to leave it up all the time, that would be best. Downside #2: the cover and padding are kinda flimsy and thin, which surprised me considering how super sturdy the frame is. Eventually I’ll make a better cover with a thicker pad. The worst downside: it’s pricey. Over $250! I gulped hard when I bought it. But I’ll never have to buy—or be annoyed by—another board. 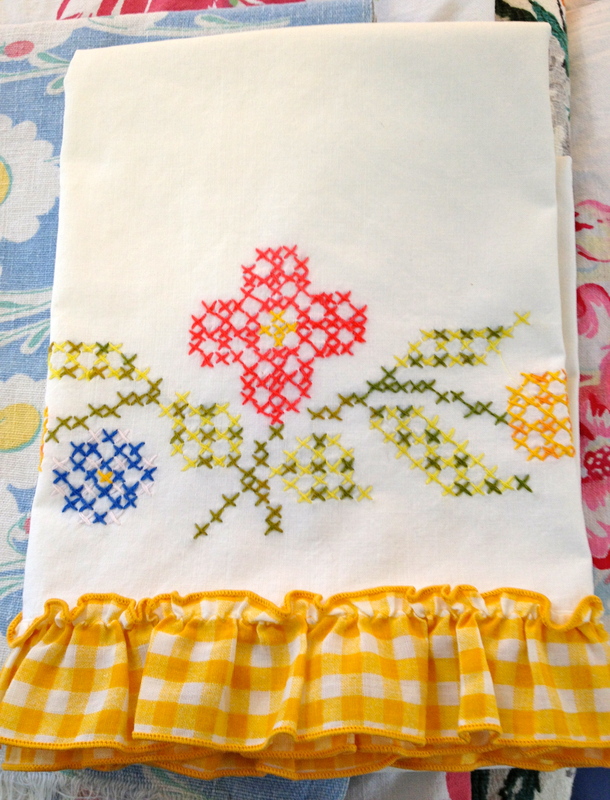 Vintage cross-stitched pillowcase with a yellow gingham ruffle—freshly ironed! Now if I only had Jane-Ray’s amazing iron . . .
Wow . . . I didn’t know these existed! Love it! They *are* great. I have an artist friend who works primarily with big textiles. She used to wrestle with a big sheet of plywood she’d balance on her old pointy-end board. Got herself a Reliable & she’ll never go back! That is one insane ironing board. I have a vintage one (in turquoise) that I use for display at shows. 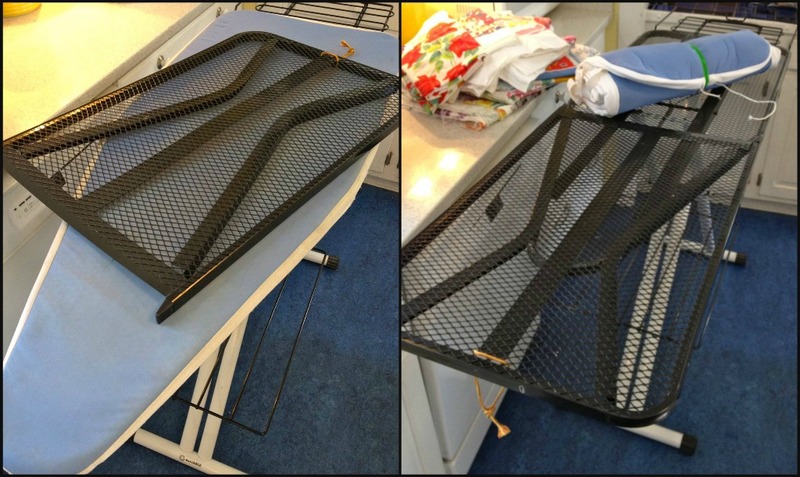 I also have a bunch of child’s ironing boards that I use for display too. That steel extension piece is brilliant! Woah! Okay, we should move into a duplex so we can share my iron and your ironing board! Otherwise I have to update my “Must Have” list and sell another pile of tablecloths to fund my own.